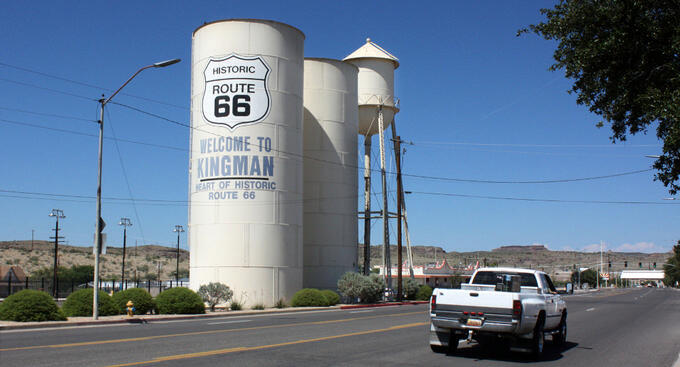 Kingman, AZ is located along the historic Route 66, and offers a number of museums and attractions geared toward Route 66 enthusiasts. 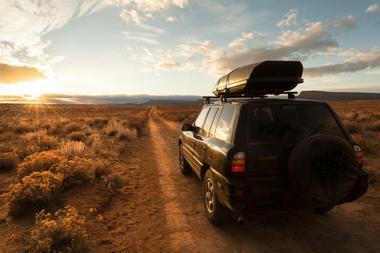 It also serves as a major gateway for travelers headed to the Las Vegas Strip, the Grand Canyon, and the recreational areas near Lakes Mead, Mohave, and Havasu. Historic Route 66 Museum is located within the former Kingman Powerhouse museum and visitor center complex, opened to the public in May of 2001. The museum is open daily and offers exhibits showcasing the development of the 35th parallel into one of the United States' most iconic highway routes, chronicling the history of the Mother Road from its use as an indigenous trade route to the height of its 1950s Main Street America fame. In 2014, the museum opened the nation's first Route 66 electric vehicle exhibit, showcasing more than a dozen vehicles dating back to the 19th century, on loan from the Historic Electric Vehicle Foundation. Curriculum-incorporated field trip opportunities are available for elementary and secondary school students, with a museum scavenger hunt activity available to enhance student groups' experience. Mohave Museum of History and Arts is a private nonprofit museum that is dedicated to preserving Northwestern Arizona's indigenous history and culture, with a focus on the Chemehuevi, Havasupai, Hualapai, Mohave, and Paiute tribes that have historically called the region home. The museum was founded in 1961 and features a large number of exhibits and displays originally developed by artist Roy Purcell, the museum's first director. 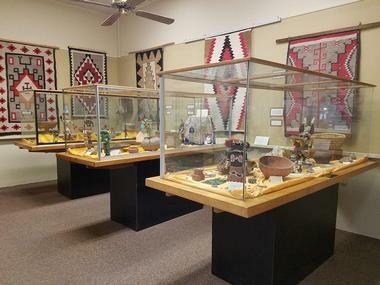 Exhibits detail the region's history from the prehistoric era to the present day, showcasing photographs, paintings, and arts and crafts items produced by indigenous populations. The museum's research facility serves as a comprehensive collection of civic materials related to the Mohave County region, open to the public Wednesdays and Thursdays. The museum is operated by the Mohave County Historical Society, which offers combination tickets to experience its sister Route 66 Museum and Bonelli House facilities. Alpacas of the Southwest is a fully-operational alpaca ranch that was opened to the public in 2002 and has been highlighted on NBC12 News as one of the region's top visitor attractions. The ranch is home to alpacas and crias with Peruvian, Bolivian, and Chilean heritage, which can be seen up close and personal as part of guided photo opportunity tours. Drop-in tours are available Thursdays through Mondays, with guided tour reservations available throughout the week for small groups. Visitors are welcome to bring their own lunches to enjoy at the ranch's picnic area and may feed alpacas as part of tour packages. The ranch also sells therapeutic socks woven with alpaca fiber, available in a variety of sizes and styles. Metcalf Park is a public park facility in Kingman, dedicated to the memory of civic leader and land developer Charles Metcalfe, the driving force behind Hualapai Mountain Park. The compact, tree-lined park is free and open to the public seven days a week during daylight hours, offering seating areas, grills, and a playground facility for young visitors. Its wide open green spaces make the park a local favorite for picnics and events, including the annual Mother's Day Arts and Crafts Festival in May. The park also features a stage area showcasing concerts and events, including the annual Sounds of Kingman summer concert series. Kingman Railroad Museum is a volunteer-run railroad museum that is housed along Route 66 in the former Kingman Santa Fe Railroad Depot facility, which was constructed in 1907. The depot was listed on the National Register of Historic Places in 1986 and converted into a public museum facility in 2011. Model trains and railroad industry artifacts are showcased throughout the museum's exhibits, along with a selection of rolling stock from the mid-20th century, some of which may be toured as climb-aboard exhibits. Visitors may also observe current trains running at the depot's Amtrak station from the museum's large, spacious windows. Hualapai Mountain Park is a Mohave County public park that was originally developed in the 1930s as a project of the Civilian Conservation Corps. The park's name pays tribute to the region's Hualapai indigenous tribe, who historically called the park's lands home. Today, the park spans more than 2,300 acres throughout the county, offering several public recreation areas, campsites and RV hookups, and cabin and teepee rentals. 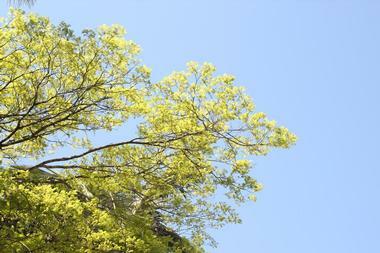 10 miles of hiking trails span the park's varied terrain, which reaches elevations of 8,147 feet. Informational displays throughout the park detail its construction and development as part of the New Deal's urban development programs and present facts about its vegetation, wildlife, and natural features. Stetson Winery was opened in 2012 by husband and wife team Jo and Don Stetson, located approximately 15 miles north of the city of Kingman along Route 66. As northwestern Arizona's only winery and event center, the winery complex is home to a barn-themed Stetson Event Center which was designed by California's Thirtieth Street Architects and is available for private special event rental. Its wines are carefully crafted by award-winning vintner Eric Glomski, whose wines were chosen in 2012 as the official wine of the Arizona State Centennial. Wines available for purchase and tasting at the venue's veranda tasting room include its Peacemaker Petite Sirah, Red Lady California Merlot, Root 66 California Red Table Wine, and Cultured Cowboy Sonoma County Chardonnay. Bonelli House is a historic home in Kingman that served as the second custom home constructed by prominent cattle rancher and retail shop owner George A. Bonelli, after his family's first residence burned to the ground due to an electrical fire. The house remained in the Bonelli family for several generations before its purchase by the City of Kingman in 1973. It was then developed into a living history home museum by the Mohave County Historical Society, which has been offering guided public tours of the home since 1978. 25-minute tours are available on weekdays, showcasing the home's original architecture and furnishings, along with artifacts preserved following the first Bonelli home fire. Cella Winery was founded in 2006 by Buenos Aires native and California body shop owner Carlos Cella, who cultivated a love of winemaking as a young man and planted his first vineyards in 2008. The company has been producing its Estate Wines line since 2010, which has received major awards at the Arizona Wine and Food Fest. A full lineup of wines are available for tasting and sales at the company's public tasting room, which was opened in 2014. Malbec, moscato, merlot, cabernet sauvignon, and zinfandel varietals are available as part of the company's Estate Wines line. It also produces a California Wines line, which features merlots, cabernets, syrahs, and red and white wine blends. Giganticus Headicus is a large-scale sculpture that is located at the Route 66 Antares Visitor Center, which was opened in November of 2016 at Antares Point, the longest continuous curve along a United States highway. The unique roadside statue was constructed in 2004 by New Jersey artist Gregg Arnold, who is currently in the process of constructing more art pieces for the facility. It stands 14 feet tall and evokes the image of a tiki head, sculpted from a combination of metal, wood, wire, cement and styrofoam. At the visitor center, visitors can purchase miniature versions of the statue, along with other unique gift shop items. The Farmhouse is a decor shop and art supply store that was opened by Barb Charon in 2016. The following year, it moved its operations from its original location to a 4,000-square-foot remodeled storefront in Kingman's downtown district. The store specializes in vintage and antique decor pieces, selling a large collection of handmade and refurbished home items. Custom upholstery is also sold, along with paints and signs sold as part of the Chalk Paint by Annie Sloan® line. Public arts and crafting workshops are held periodically at the store, which also offers free cookies to all visitors on Saturdays as a customer appreciation gesture. Black Bridge Brewery was opened in 2013 by brewmaster Tim Schritter, named for a historic railroad bridge on Kingman's outskirts that has been a popular youth hangout spot since the 1960s. The brewery features a state-of-the-art 45-gallon brewing system that was constructed by hand by Schritter, a lifelong welder and metal fabricator. Its public tap room offers a variety of the company's ales on draft, including its Evil Red Hopbursted Ale, Wicked Poison Wheat Wine, 80 Shilling Ale, and Locomotive Stout beers. Cold-brew coffee is also served, along with the company's signature housemade ginger beer. A variety of public special events are offered at the tap room, including pub quiz nights and happy hour events. Lewis Kingman Park is a public park owned by the City of Kingman that was named for the town's namesake, Lewis Kingman, an 1880 railroad surveyor. The nine-acre park is the city's only public dog park facility, offering a double-gated off-leash dog run area with ample lighting. Separate fenced areas are offered for small and large dogs for safe play experiences, with owners encouraged to participate in their dog's exercise fun. A monument and plaque dedicated to Kingman are also showcased at the park, along with a picnic area offering public restrooms, tables, and grills. 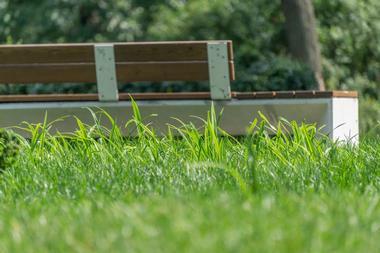 Expansive green spaces are also offered for lounging and picnicking. Desert Diamond Distillery is the state's oldest craft distillery, opened in April of 2010 within the Kingman Airport Industrial Complex. The distillery was founded by the Patt family, who had originally intended to open a brewery or winery before attending an industry distillery conference and falling in love with the craft of producing fine spirits. 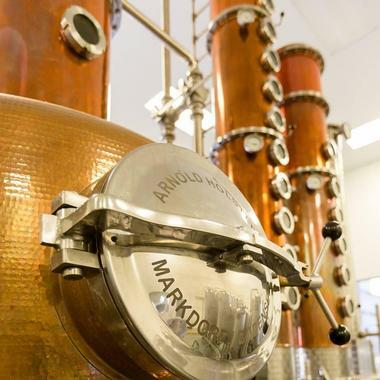 Today, the distillery produces five premium liquors, including their signature Gold Miner White Rum, a SIP Award winner in 2011, and their Gold Miner Barrel Reserve Rum, which has garnered five awards from the San Francisco World Spirits Competition. Flight tastings, craft cocktails, and behind-the-scenes tours are offered at their public tasting room, which also offers a retail shop selling cocktail mixers and liquor-tasting accessories. 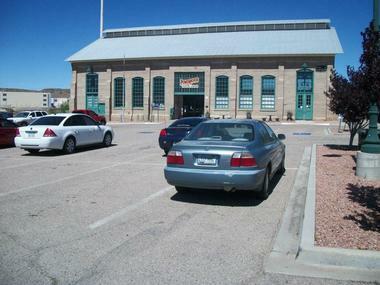 Kingman Visitor Center is housed within the historic Kingman Powerhouse building, which was opened in 1909 and provided Kingman and Mohave Counties with revolutionary, affordable electric power service for three decades. Despite the plant's initial success, it fell into decline throughout much of the 20th century after its 1935 purchase by the Citizens Utilities Company of Delaware, sitting idle until its 1978 purchase by the Powerhouse Gang restoration society. With support from the State Historic Preservation Office, the building was converted into a visitor and museum center for the Kingman area, which now houses museums such as the Arizona Route 66 Museum, the Carlos Elmer Photo Gallery, and the 66 Kid Exhibition. The powerhouse's visitor center is open seven days a week throughout the morning and afternoon hours, offering information on area attractions, along with a gift shop selling local souvenirs. Desert Wonder Tours and Trips was founded by Robert Walton and aims to offer custom-designed commercial tours and trips throughout the Mohave Desert region. 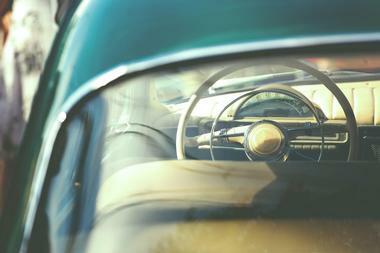 All tours last between one and four hours and explore location historic, natural, and cultural attractions year-round. Tours are narrated by local author and personality Jim Hinckley, with some tours offering live narration during the trip and others featuring guided tours at attraction destinations. Major attractions explored as part of tour packages include Historic Route 66, the Grand Canyon and its surrounding caverns, the Las Vegas strip, the Joshua Tree Forest, and the Hoover Dam. Hiking, biking, and horseback tours are also available, along with winery, brewery, restaurant, shopping, and museum excursions. El Palacio is a family-owned Mexican restaurant that has been named as one of the American Southwest's best local-favorite restaurants by Arizona Highway magazine. 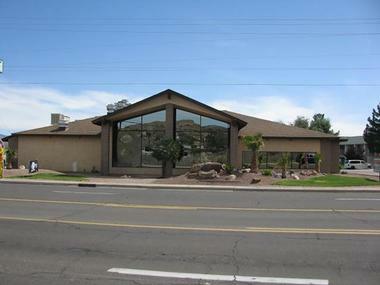 The restaurant's first location was opened in 1992, with the chain offering six locations today, including a Kingman location that was opened to the public in 1995. 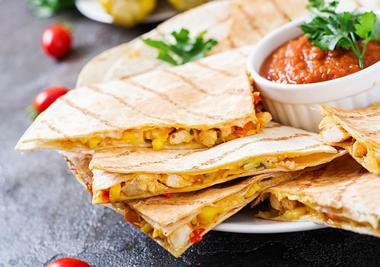 It has received a number of industry accolades over the past two decades, including awards at the Arizona Taco Festival, the Maricopa Salsa Festival, and Chandler's Culinary Festival. A large menu of traditional Mexican fare is served at lunch and dinner, including burritos, tostadas, and platillos de huevos. Make-your-own combination dishes are available, along with a la carte enchiladas, tacos, and empanadas. Calico's is a contemporary American restaurant located adjacent to the attractions of the Powerhouse Visitor Center in Kingman's downtown district. 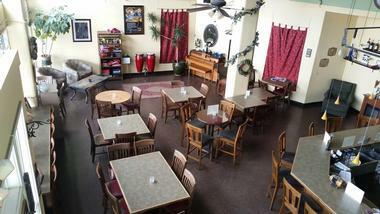 The restaurant has been in operation since 1987 and has received numerous Reader's Choice Awards from the Daily Miner. Breakfast, lunch, and dinner service are offered seven days a week, highlighting steak, seafood, and prime rib dishes, along with a variety of vegetarian and low-carb menu options. The upscale family-friendly restaurant also offers a homemade breakfast buffet on Sundays, a make-your-own-sandwich bar on Thursdays, and a wide variety of coffee shop beverages and homemade desserts served daily. 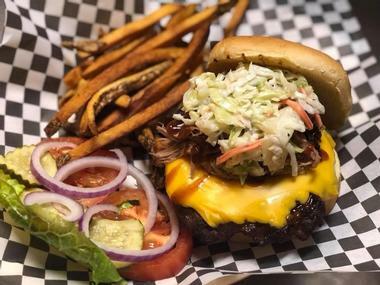 Floyd and Company Real Pit BBQ is a family-owned traditional barbecue restaurant located in downtown Kingman that specializes in hickory-smoked Southern barbecue dishes. The restaurant uses Tennessee-style barbecue techniques to craft entrees such as real pit barbecue, pulled pork, and baby-back ribs. Authentic wood-fired artisan pizzas are also offered, including create-your-own variants. At lunch, wood-fired sandwich choices highlight traditional options such as pulled pork Cubans, with combination soup or salad platters available. All pizzas are also available in personal sizes at lunch, with the exception of dessert pizza options. Online ordering is available for lunch and dinner entrees for takeout or delivery through the restaurant's website. Diana's Cellar Door Wine Bar is Kingman's first and most popular wine bar, serving a wide variety of locally-produced Arizona wines that may be savored in-house or purchased for takeout. A full craft beer menu is also available, featuring regional and national favorites from breweries such as Black Bridge Brewery and Dogfish Head Brewery. Craft cocktails are also served, including Moscow mules made with locally-sourced ginger beer. Though the bar does not serve its own food, customers are welcome to order delivery from a number of local restaurants. Each month, the bar hosts Art Uncorked painting workshop events led by local instructor Kathey Hutchings. Live music performances are also showcased most evenings.